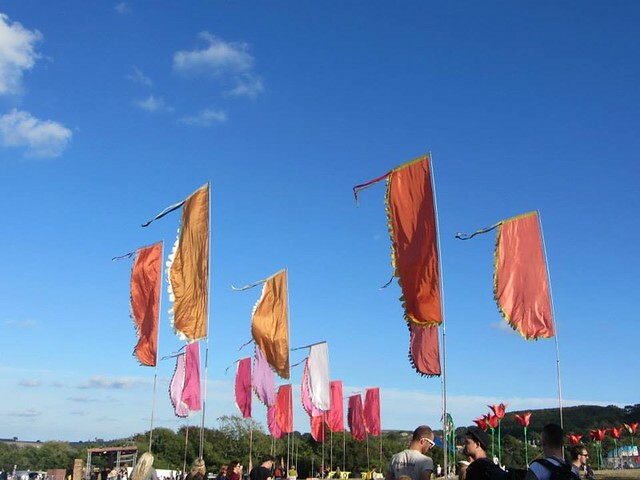 September means the end of festival season here in the UK and Bestival is one of the last major festivals of the year. Radio 1 DJ Rob da Bank and his wife Josie curated a wonderful line up this year to celebrate the tenth anniversary of Bestival. Some festivals concentrate on just the musical line up but Josie works hard on creating a beautiful site and a full experience. 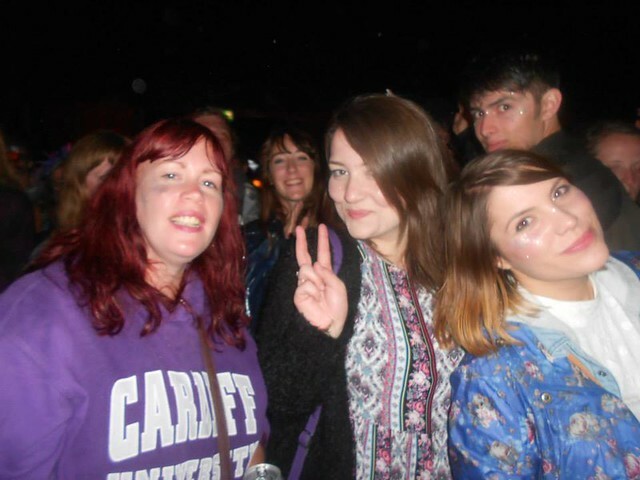 I had the most wonderful time at Bestival last year with lots of blogging chums and couldn't wait to return. 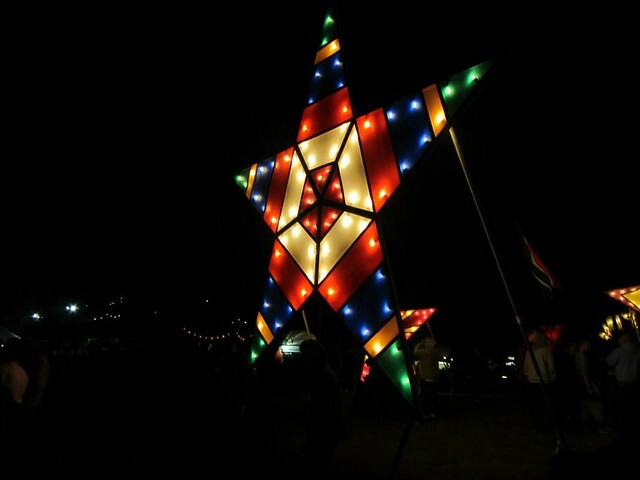 Each year Bestival has a theme and this year's was HMS Bestival. People dressed up all weekend as sailors, mermaids, pirates and various sea creatures and there was a spectacular new stage that was a giant ship and 40ft giant anchor on the main stage. There are loads of photos in this post and some were taken by my friends Harri, Emma or Laura. This year’s line-up was a very eletronic as always but there were still plenty of bands and things to keep this soul girl interested. 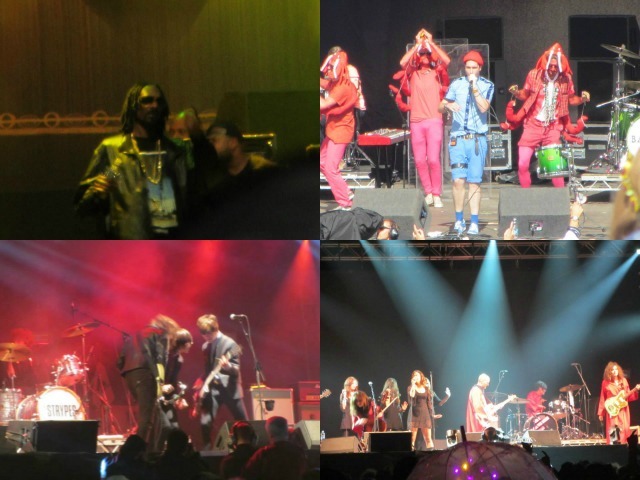 I managed to see Bastille, The Strypes, Snoop Dogg and The Polyphonic Spree do the Rocky Horror Picture Show. Bestival really is a place where you get to see some more unusual acts and you find yourself singing along to all sorts. I also danced in front of a huge shipwreck whilst Annie Mac was on the decks with lasers floating above the crowd and dancers twirled from huge cranes. Bestival definitely opens me up to listening to different types of music and to experience acts I would never see at home. A few things dominate my festival experience each year and they include glitter, vodka, frolicking and obviously the music. 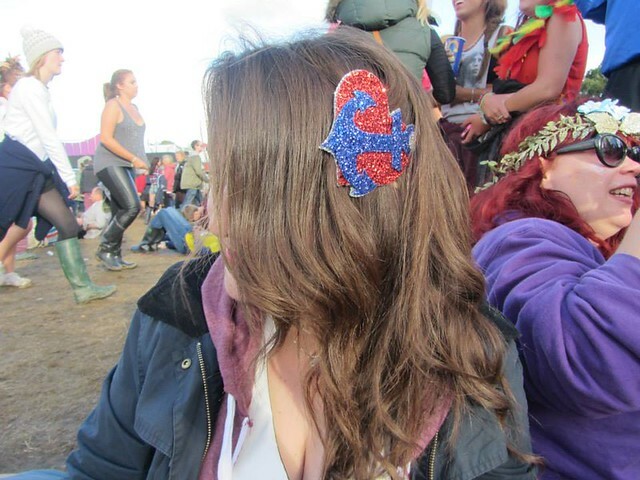 It's over a week since I arrived home from Bestival and there are still a few specks of glitter lingering on my belongings. I wore my lovely Crown and Glory custom fascinator for the fancy dress day. I got to try out some fantastic Fickle tattoos with a very fitting nautical theme. If you're anything like me and way too scared to get permanently inked then these are a fun way to try it out without the pain. They were easy to apply and lasted without any wear for about two days. 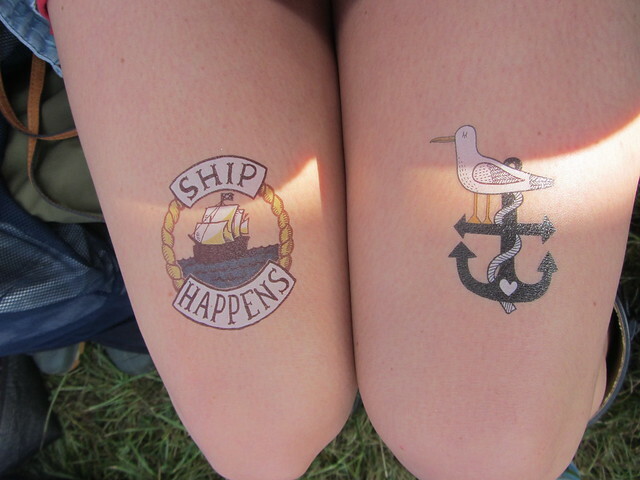 The 'Ship Happens' design was definitely my favourite and got lots of comments from other festival goers. A little merry on the Saturday watching Franz Ferdinand. The forecast for the weekend was pretty grim so I took my waxed jacket with me, plenty of waterproofs and some sensible footwear to deal with the mud but we really only had a few showers so we were very lucky. I had visions of knee high mud and freezing temperatures. I think I'm probably going to take more jumpers and a pair of lighter Dr Martens next year as my wellies got a little heavy after 4 days wear. 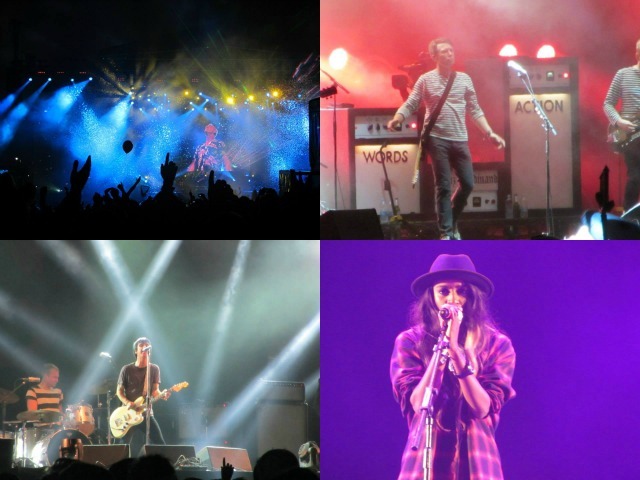 My musical highlights of the weekend wwre Johnny Marr playing some of my favourite Smiths songs and seeing the rapper Angel Haze for the first time. The Sunday night headliner is always a bit special and this year's was no exception. Elton John hadn’t headlined a UK festival since 1969 and he played his hits from six decades for over two hours. There was one point during the set where he looked close to tears and said he would never forget his Bestival performance which for a diva like him was pretty touching. 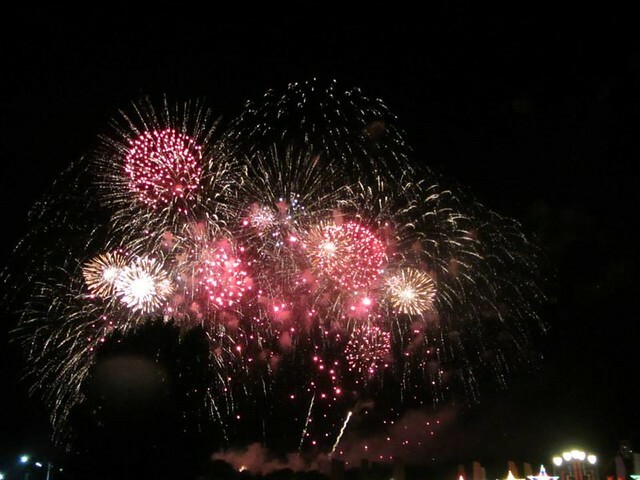 The weekend drew to a close with a spectacular 10th birthday firework display. 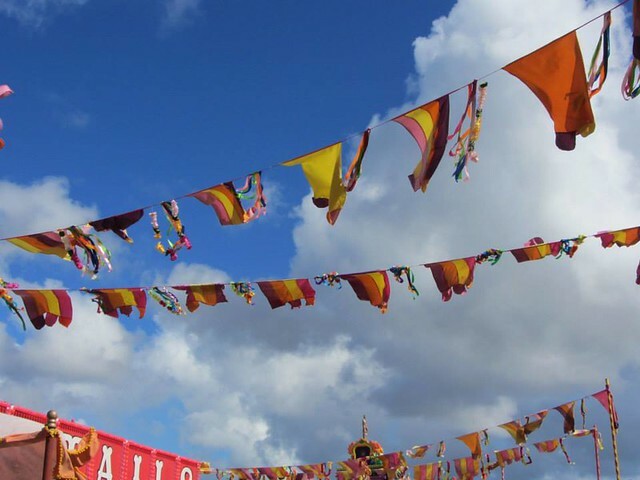 If you don’t manage to get Glastonbury tickets next year you should go to Bestival. 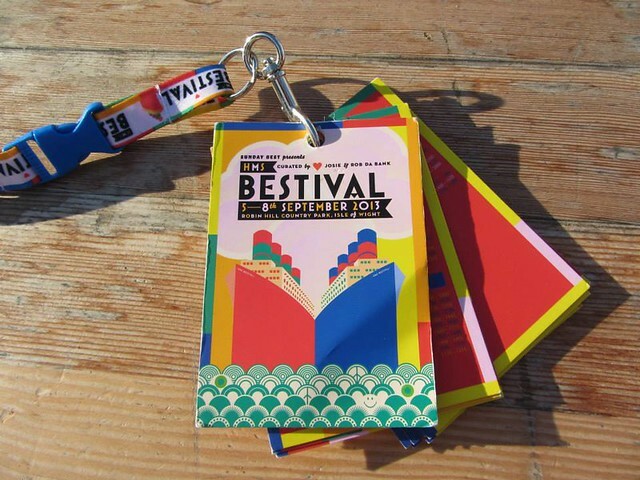 If you do get tickets, go to Bestival anyway! 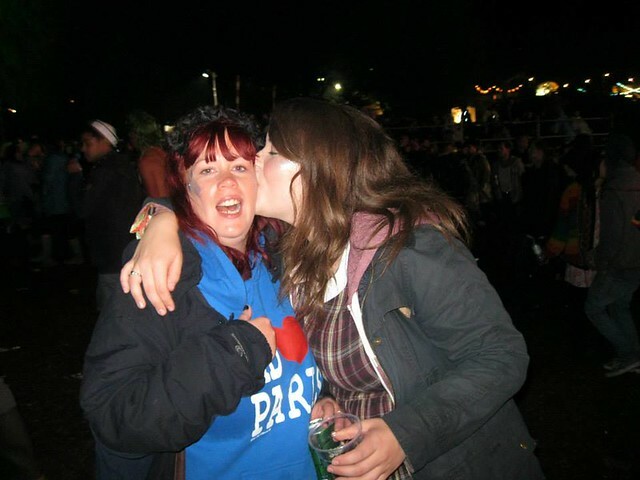 Happy birthday Bestival, hope you're around for another 10 years. Ah now you're wanting me to try and get tickets - it looks like so much fun! I've only ever been to Reading! Sounds amazing! I saw Johnny Marr at Reading and I bloody loved him. It's awesome being able to hear Smiths songs without having to listen to Morrissey mouth off in-between songs! Bestival always sounds like so much fun, the one festival I am tempted to try! Judging by the picture, I must've been standing right next to you for Angel Haze! aaaah I was right at the font, such a small crowd :( Shame she was on the same time as Elton because so many people missed out on her.